The Following Books are for Coaches: Click on any cover to order the selected book. This handbook contains over 170 easy-to-use forms, letters, and checklists applicable to any school district and athletic program. Coaches and athletic directors can depend on this manual to simplify their duties, communicate more effectively, and become more efficient. Athletic leaders can save time and improve their communication skills with this convenient resource which boasts useful tools for pre-season, regular season, and post-season. 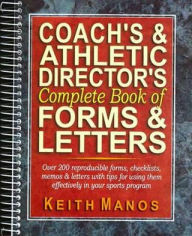 The individual who purchases this book may reproduce the various forms, letters, and memos for individual and team use. Practical Techniques and Materials for Building an Effective Program and a Winning Team. Addresses the most important part of coaching: motivating athletes. Offers over 100 specific and detailed ideas for establishing a positive team culture and a successful, winning organization. Includes ideas for the preseason, early in the season, all season, mid season, postseason and more. Ideal for coaches and administrators of all sports with athletes at any level of play. 101 Strategies for Coaching Winning Wrestling provides coaches with a plan to maximize the success of their wrestlers. The book provides a very accurate and detailed explanation of how to run a successful wrestling program. The 101 strategies are separated into chapters detailing under what circumstances a specific strategy is best used, including pre-season, the entire season, first week of the season, the day before a match or tournament, the day of a match or tournament, after matches or tournaments, final weeks of the season, and post-season. Coaches and Athletic Director’s Book of Forms and Letters. Focuses on fundamental drills every coach can use with his wrestlers so they avoid position mistakes, improve their strength and stamina, and enhance their athleticism. The 100+ drills and games are thoroughly explained with locations, descriptions, and coaching points, and cover: warm-up and flexibility, agility, neutral position—offense, neutral position—defense, top position, bottom position, endurance, stamina, and strength, resistance training, competitive wrestling drills, and more. Contains nearly 80 photographs.